When I first properly got into make up I read post after post about foundations, trying to find some insight into that seemingly impossible feat of finding a good match and a nice formula. 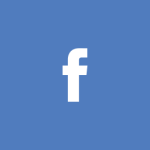 In fact, if you read any comments on many blogs you will see that the quest for the perfect match is one of the recurring topics. 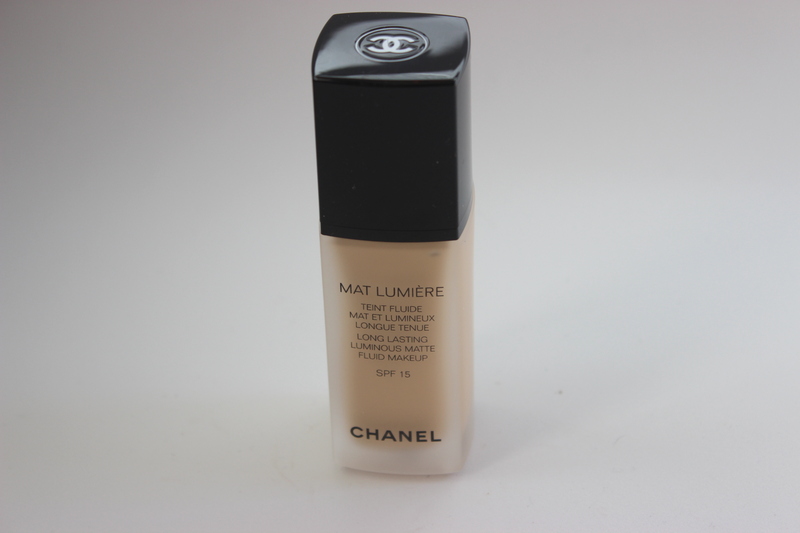 I was looking for something that controlled my shiny spots, so I ended choosing a matte foundation: Chanel’s Mat Lumière in 20 Clair (around 40€ for 30 mL). At that time I loved it! It will last and even survive my skin’s sebum production. However, it is a bit thick and can look a bit overdone if that is not what you are looking for. As I started to veer towards more lightweight formulas, the Chanel one was lost in a make up drawer for a long time. I had also noticed that 20 Clair is quite a neutral shade, so it does not really match my skin’s yellow undertone, which is another disadvantage.However, whenever I want to rock the pale look or I want to look pinupy in a red lipstick and impeccable pale skin, I reach for this foundation. Next I went the opposite way and tried MAC’s Face and Body and I fell head over heals. It was everything I had been looking for: skinlike and buildable. The best way to apply it is with fingers and it is good to know that the more you work it the more coverage it gives. I soon discovered that it also worked wonders on legs or arms if I was wearing something a bit revealing and that I could use it to sheer out other heavier foundations. Moreover, this foundation has no SPF so it photographs beautifully. Another good point was that it had a very good price at 41€ per 120mL, so I felt as if I had won the foundation jackpot! The drawback was that it was a bit too dewy for someone like me and had no oil control capabilities. As soon as it started being hot and humid I had to start carrying blotting papers and MAC’s Blot powder in my purse everywhere! 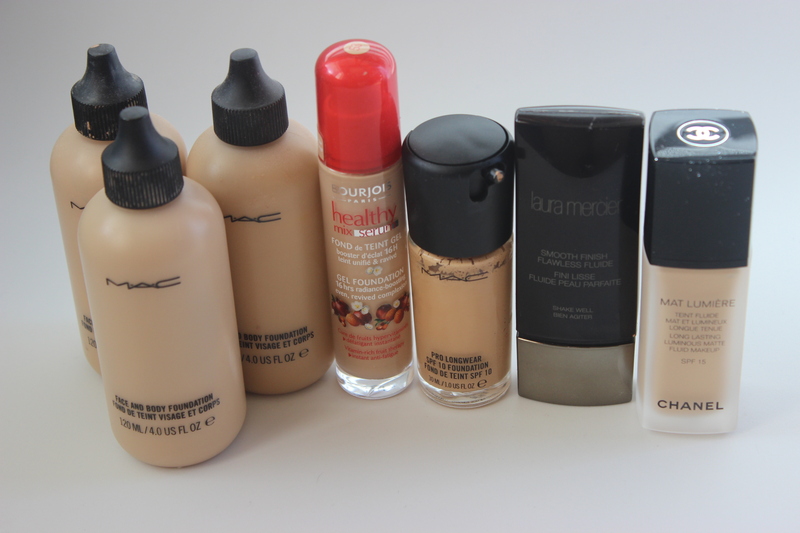 Nowadays I love this foundation whenever it is not too hot or I am only going out of the house for a couple of hours and I also keep mixing it with other heavier formulas. Looking for something that would stay put while at work, I tried MAC’s Pro Longwear foundation next (32€ for 30mL). Many days I don’t really like the finish of this one as I easily look cakey if I get a big heavy handed with it (which has been known to happen when in a rush). Also, for some reason the NC20 in this formula looks a tad dark and orange for me. However it has good staying power as promised. If I were not so oily, I bet that I would get no separation or melting around my nose or chin. This is a foundation that tends to look better when you have worn it for an hour or so. To lighten up the shade and get a similar effect, I tend to mix it with Face and Body or with a tinted moisturiser. After the Pro Longwear not being exactly what I looked for, I tried Burjois’ Healthy Mix Serum (around 15€ for 30mL). This foundation has a gel like texture that I love, a very nice coverage and the most glorious dewy finish ever. Yep, you might have noticed that I went for another dewy finish foundation, as if I had not had enough of looking shiny after a few hours before! As you can guess, although it looks beautiful on the skin and does not disintegrate like the Pro Longwear foundation, one of the disadvantages is that my oily skin combined with the dewy finish mean that I have to blot after only a few hours. Another disadvantage is that the lightest shade available here is number 53, which looks dark on me even when I am tanned! And the final let down is that it contains alcohol in its formulation, which is a bit of a let down. Still looking for something with a nice finish and lightweight, I then I tried tinted moisturisers and fell in love with them. I like both MAC’s and Laura Mercier’s, as I wrote about them here, each has its own good points but they too tend to succumb to my oily areas. Once more I need to carry blotting papers and powder with me. However I was still looking for something that looked just like my skin and had not given up on finding a proper base. 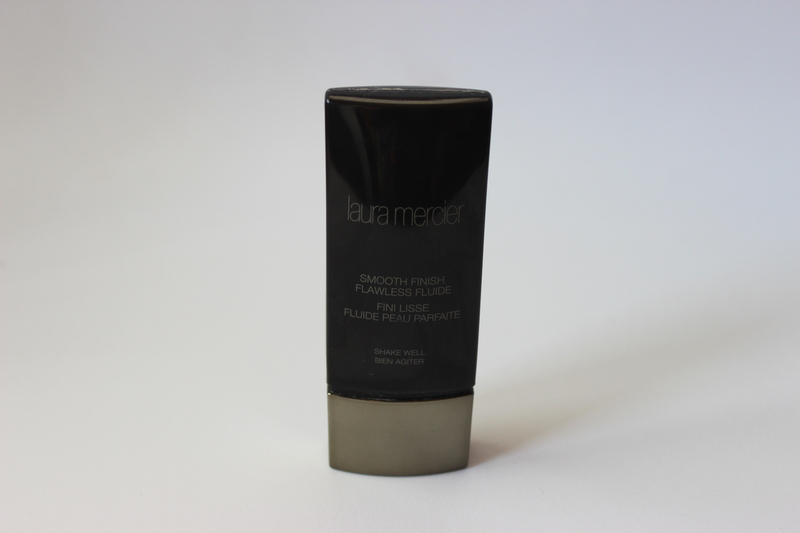 That is when I remembered all the raves over Laura Mercier’s Smooth Finish Flawless Fluide foundation (48€ for 30mL). And all those reviews were right, it is gorgeous! It is quite a watery and sheer fluide that goes on like skin. It sets quite quickly as well so you do not need to wait as much as you do with a foundation like Face and Body. 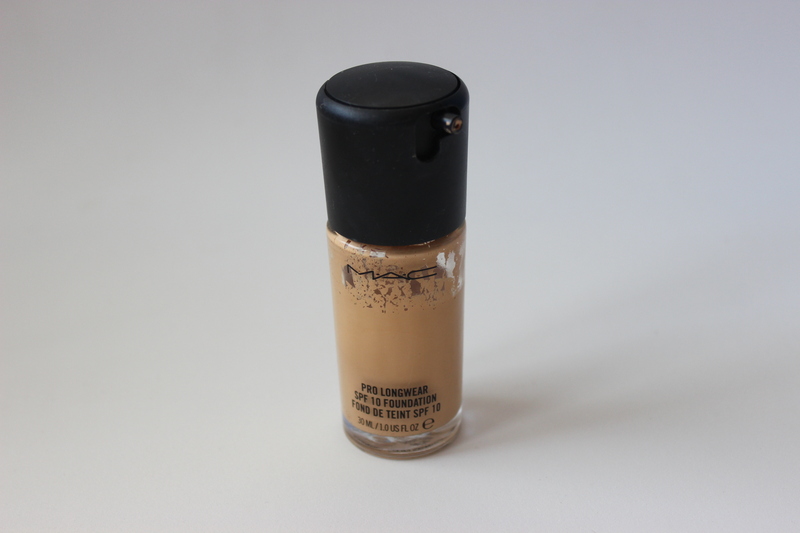 Despite its lightweight feeling, it provides a very good coverage with just a few drops. Although it has no oil control capabilities, it does not disintegrate with it either, which is a very good thing indeed! I am already used to carry blotting papers and powder but I want the foundation to still look good when I take it off. Below you can see some photographs were you can compare the textures and shades. The top three foundations are Face and Body in the shades C3, N1 and C1. As you can see it is a very watery foundation. I see little to no difference between N1 and C1 once they are applied as they sheer out and I use C3 to darken the lighter shades in summer. The bottom swatch is of Chanel Mat Lumière. 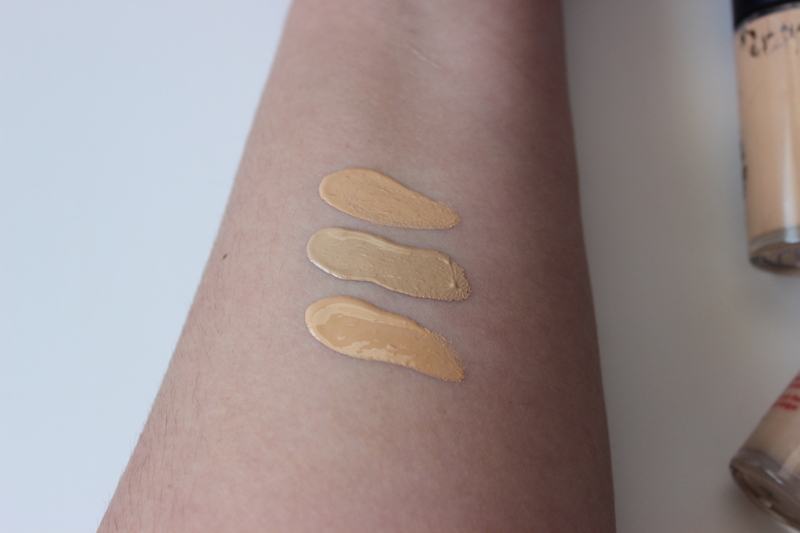 The shade is not that lighter than C1 or N1 but as it has a more opaque consistency it does look more neutral and lighter than my skin tone once applied. 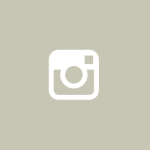 At the top of the photograph is the Laura Mercier foundation. As you can see the shade that I got, Macadamia, is a bit dark and orange. As soon as I finish the bottle I will choose another shade. 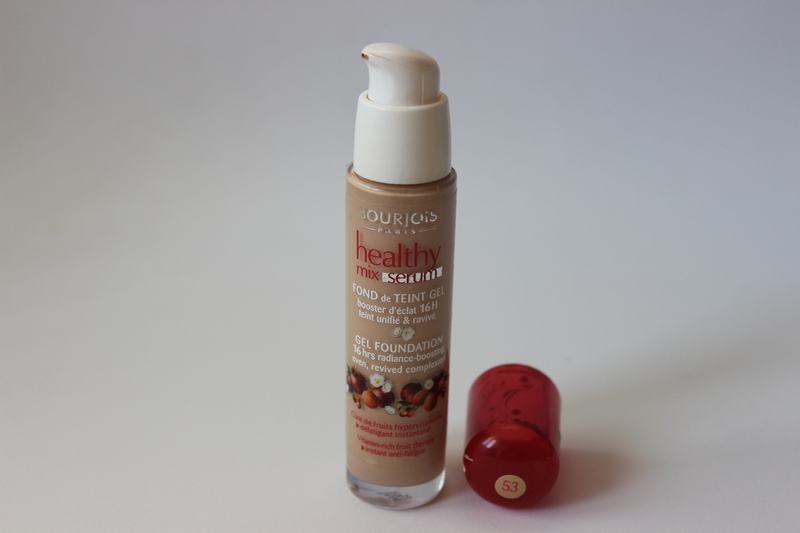 Below is the Bourjois foundation which looks much better in terms of tone but is still a bit dark. 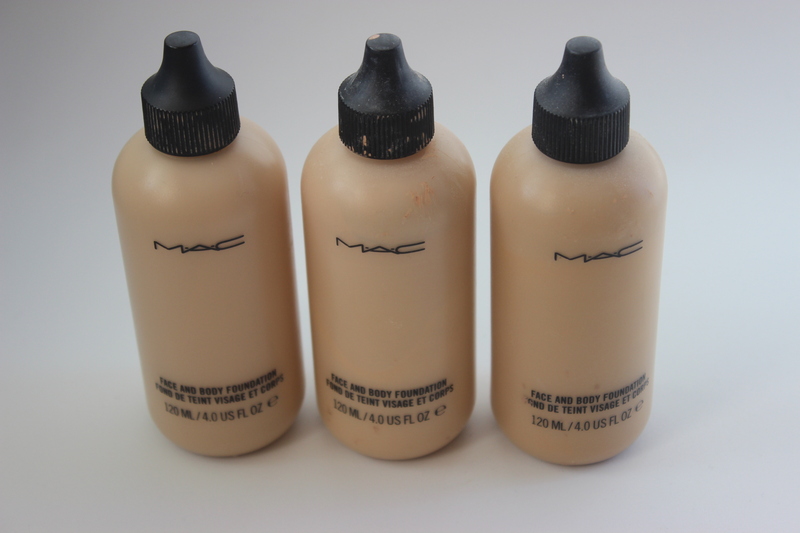 The last foundation is the Mac one, which is thicker, darker and orange. I can’t wait to finish this bottle! So, who said that finding your foundation was easy? PS: like the big procastinator that I am, this post has taken me some time to photograph and write. While doing so, a sample of the new Mac waterproof foundation has arrived chez moi and it looks like it could become a permanent resident. Stay tunned for my thoughts on it! What can I say, Face and Body was my first love and it shall always have a special space in my stash because of that 😉 I really like how skin like it is. 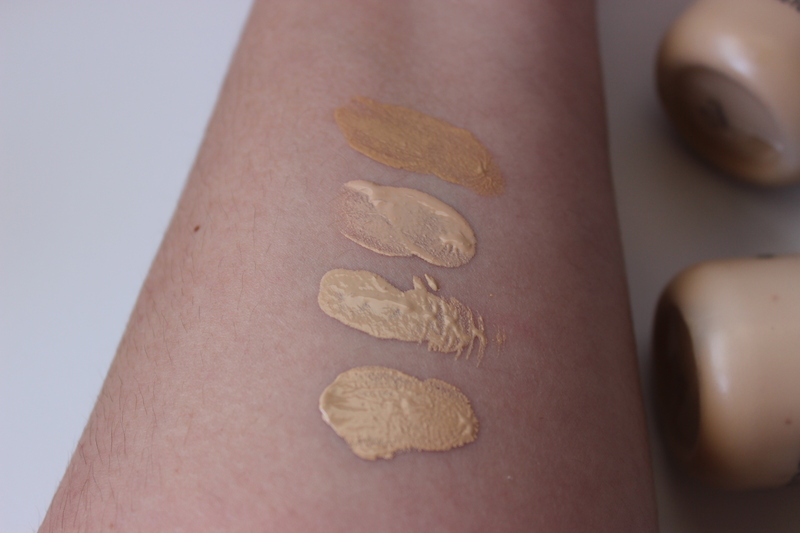 It is very “flexible” though, so you can build coverage, use it on the body, mix it with other foundations. I understand why many mua like it so much!